Should I buy a Rhodes? 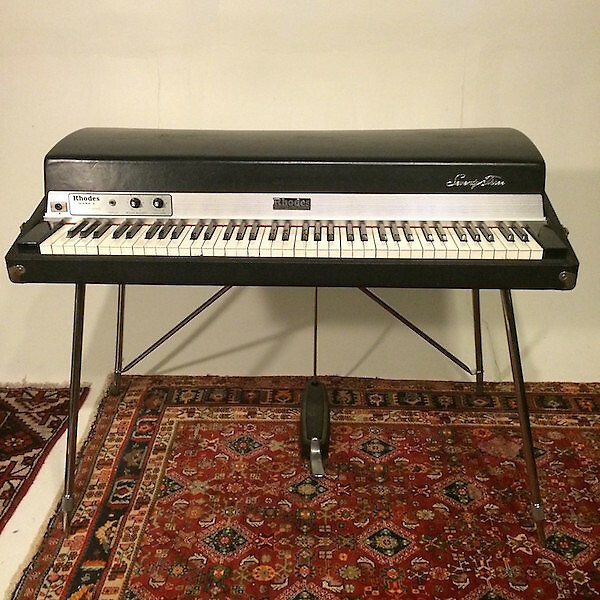 Should I buy a Wurlitzer? They're both electric pianos, right? These are the kind of questions that run through the minds of many keyboardists as they hunt down their first vintage electric piano. There are always a number of both classics available on Reverb, so let's take a moment to explore what distinguishes each of these iconic keyboards. The main difference between Rhodes and Wurlitzer keyboards is the tone. When comparing a Rhodes to a Wurlitzer, it is important to consider the source of their tonal qualities. A Rhodes electric piano uses tines as their tone source while a Wurlitzer uses reeds. Tines are metal tuning spring rods mounted to a thicker metal bar called the tone-bar. Think of a tine as a sophisticated tuning fork. The tine/tone-bar combo was derived from the idea of a traditional tuning fork used by vocalists to find correct pitch or for the tuning of string instruments. 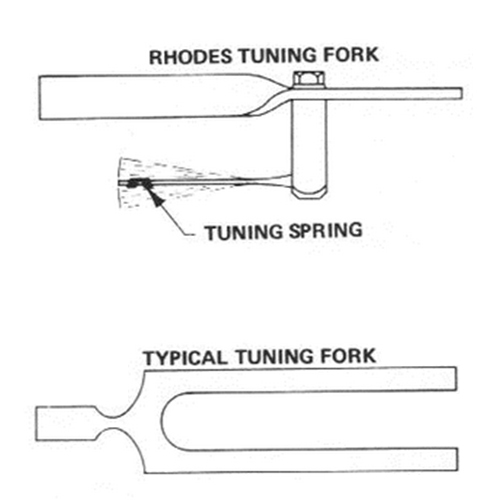 Here is the difference between a typical tuning fork and the Rhodes tine/tone-bar. The typical tuning fork has two equal prongs while the Rhodes tuning fork has a noticeably smaller bottom tuning spring (tine). The smaller spring-like bottom prong (tine) is designed to withstand the attack of a piano hammer and vibrate at a certain frequency. Every tine/tone-bar has its own designated copper-coiled pickup that is intricately wired to the preamp or output jack. 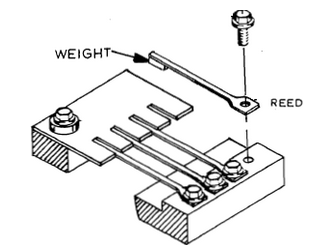 The majority of Rhodes pianos use rubber-tipped piano hammers to strike the tine. The hammers were made of wood in older models before the company switched to plastic in the mid-1970s (felt-tipped wooden hammers were used in a few early models). Depending on the material of the hammer, there may be a slight difference in tone between an older Rhodes piano with wood hammers and a later model with plastic hammers. In either case, the tine properties remain the same. When we think of reeds, we probably think first of wind instruments like clarinets or saxophones. Whereas wind instruments use wooden reeds for vibration, Wurlitzer reeds are flat strips of metal with a small weight on one end and produce vibration when struck with the piano hammer. They come in a variety of lengths to match the desired pitch or note. Unlike tines, reeds are mounted on a long shared reed bar instead of individual tone bars. The reeds lie within the grooves of a single large pickup plate. The signal from the pickup plate is routed to the onboard preamp, and the Wurlitzer uses felt hammer tips to strike the reeds. Rhodes tine pianos are known for a bell-like sound and a rich, warm, rounded tone. You can hear examples of that Rhodes sound when listening to classic songs like "You are The Sunshine of My Life" by Stevie Wonder or "No Quarter" by Led Zeppelin. 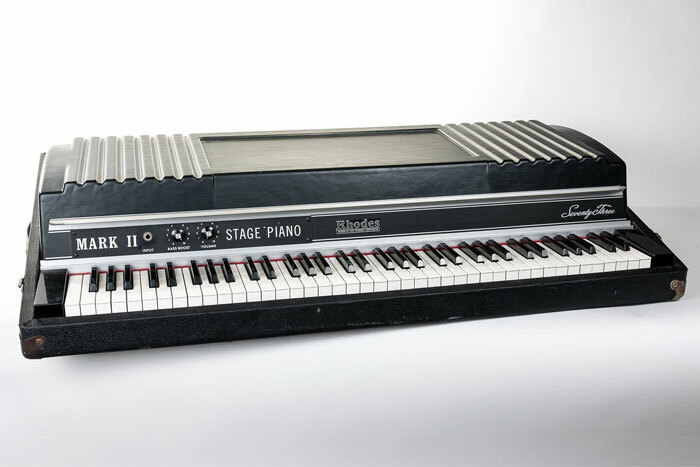 Since the piano came to market in the 1960s, many great keyboard players preferred the Rhodes tone when performing live or in the studio. This is no exception for top players like Herbie Hancock on "Chameleon," Ray Manzarek on "Riders on The Storm," or Chick Corea on almost every recording. Corea even sampled his very own Rhodes Mark V for the Yamaha Motif XF series workstation. You know that feeling you get when you hear "Goodbye Stranger" by Super Tramp? Nothing like a little 1970s with a touch of disco. Many artists over the years have incorporated the punchy reed tone of a Wurlitzer 200A in their recordings or performances. Timeless songs like "I Am The Walrus" by the Beatles or "What'd I Say" by Ray Charles both utilize a Wurlitzer electric piano. Amazing keyboardists such as John Medeski or Marco Benevento have preferred the Wurlitzer reed tone for both live and studio use because of how dirty it sounds with a little distortion; check out "Nocturnal Transmission" by Medeski, Martin and Wood. Perfect for either a clean or dirty sound, the Wurlitzer has been a choice for pop music since its debut in the 1950s. If you listen to our audio samples above, you'll notice the more bell-like tone of the Rhodes and the sharper tone of the Wurlitzer. The tones of the Wurlitzer and Rhodes are both very distinctive in the above audio samples. We can listen to the audio over and over; we also can see the difference with our own eyes. Here are two images of a recorded PCM wave sample portion from both a Rhodes and Wurlitzer middle C note (with no vibrato or tremolo). We have zoomed in and cropped a small fraction of the audio to help illustrate the contrast between wave shapes. 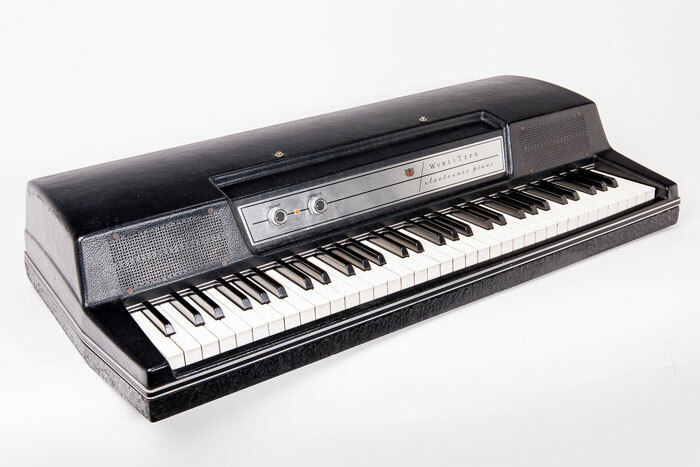 You can visibly see that the Rhodes has a more rounded sine-like shape while the Wurlitzer has a sharper triangle-like shape. These images help us identify the reason for the Rhodes' smooth, warm tone and the Wurlitzer's punchy, sharp tone. Simply put: our ears may interpret the sound one way, but our eyes don't lie. While both keyboards provide a unique tone, keyboardists are able to achieve a relatively similar sound from both instruments with the right tweaking of an amp, distortion or EQ. Another example is the option to adjust the tines on a Rhodes keyboard in relation to the pickups. Tines can be adjusted closer or farther away from the pickups, which can alter the overall tone and allow customization to the preference of the player. The Wurlitzer has slightly less customization in this regard simply because reeds are not adjustable like tines. Though the importance of sound matters, there are still factors other than tone that guide the decision between a Rhodes and Wurlitzer. For example, we can talk about features and limitations of both keyboards in regards to portability and onboard options. 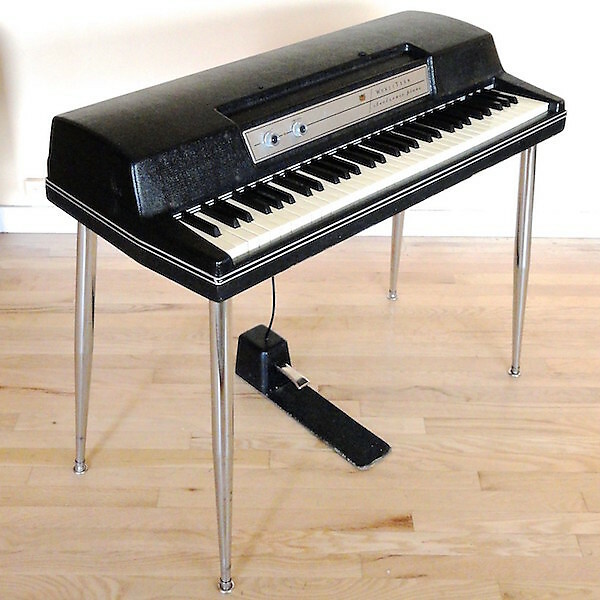 Let's compare the basic attributes of a Rhodes Stage, Rhodes Suitcase and a Wurlitzer 200A. Each company produced several models of these pianos and there are many differences that can be identified, but we will list a few of the key features found on popular models. Wurlitzer and Rhodes pianos have their own strengths and weaknesses—in the end it all comes down to use. 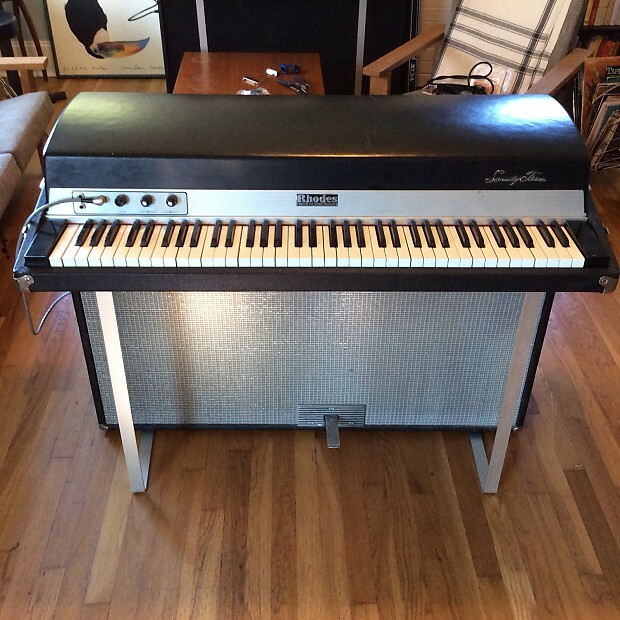 If intended for gigging, you may find a Wurlitzer an ideal choice because it is smaller in size and weighs less than a Rhodes. There are even soft-padded travel cases available for Wurlitzers. Some live players will prefer a stereo stage setup, so a suitcase Rhodes may be of interest. Rhodes stage pianos give off a super low signal level due to their lack of preamp, but many players find you can achieve a "custom" tone when using a preamp of your choice—especially a tube preamp. One other thing to keep in mind is that each note on a Rhodes keyboard has its own pickup while the Wurlitzer has a single pickup plate. More parts could equal more service and maintenance. What we have here is truly a case of apples and oranges. At this point, it comes down to choosing the features right for you and your setup. Live players may want a lighter instrument for travel or want more effects on board without the need for extra accessories. Studio players will agree that both electric pianos sound amazing for recording, and what it boils down to is the tone they want for their project. Conclusion... It's up to you! While Rhodes and Wurlitzer electric pianos vary in sound, design and functionality, the choice is ultimately up to the player. All keyboardists have their own expectations of what an electric piano should sound like. To be honest, you can't go wrong selecting a Rhodes or a Wurlitzer. Remember electric pianos are not digital machines—they are mechanical instruments with moving parts—so each one will sound just a little different than the next.